REGISTER Documenting homelessness is a critical part of housing eligibility. This webinar will provide an overview of the documentation required for different housing programs and how to go about collecting it. The webinar will review third party verification and using other systems in addition to HMIS such as police departments, hospitals, and Managing Entities. REGISTER Innovative strategies deliver a new vision of long-term solutions to end homelessness. This webinar will offer an overview of how local Florida communities are implementing progressive and creative solutions to best serve vulnerable populations. The webinar will review Managing Entity collaboration, local implementation of nationally recognized best practices, measuring success in new initiatives, and will offer ideas on how to design and implement innovative strategies in your own community. REGISTER As an advocate, it is important to be knowledgeable about how state legislation directly impacts affordable housing and homeless systems, both locally and state-wide. 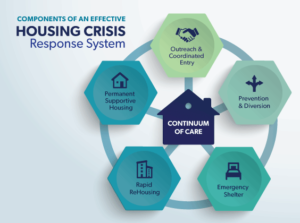 This webinar provides a summary of the 2018-2019 legislative actions that impact homeless systems and affordable housing funding throughout the State of Florida. In addition, this webinar will educate advocates based on real-time information that includes an overview of funding appropriated for housing & homelessness, changes to statutes, and review proposed bills.